Entrada at Snow Canyon is a private equity country club built around an 18-hole championship private course. Owning a single-family home allows buyers to purchase a membership for the Entrada at Snow Canyon Country Club. This gated community was started in 1996 and will be comprised of 1,682 homes built by several builders. This community is open to buyers of all ages, and its leisure activities and elegant homes will appeal to any discerning homebuyer. The unique landscape around the community creates the ideal surroundings to stay active while St. George's rock vistas, rolling dunes and sandstone cliffs create a serene environment. Designed by Johnny Miller, the golf course stretches across 7,085 yards. Ranked as Utah's number one year-round course in Utah by Golf Digest Magazine, the design winds through meandering streams and ancient black lava. Managed by the renowned Troon Prive' golf management company, the par-71 course offers an invigorating round of golf for players of various skill levels. This community boasts a 22,000 square-foot clubhouse that houses a golf shop, locker rooms, a ball room and the Kokopelli Restaurant and Lounge. The private restaurant serves fine dining and casual fare for members. There is a 13,000 square-foot fitness center that includes an aerobics studio and spin bike area where residents can workout while enjoying mountain views. The grounds also include pools, tennis courts and volleyball courts. This community features elegant home sites, some with incredible views. Several builders offer new construction and custom homes. These include patio homes ranging from 1,500 to over 3,000 square feet a well as large custom estates exceeding 10,000 square feet of living space. Buyers may chose from resale homes as they becomes available. Interested parties looking to build custom homes can do so until all 1,682 homesites have been fully developed. Many of the residences have spectacular views of Red Mountain and are within proximity of hiking and biking trails. Homes are built with open floor plans to maximize the influx of natural light. 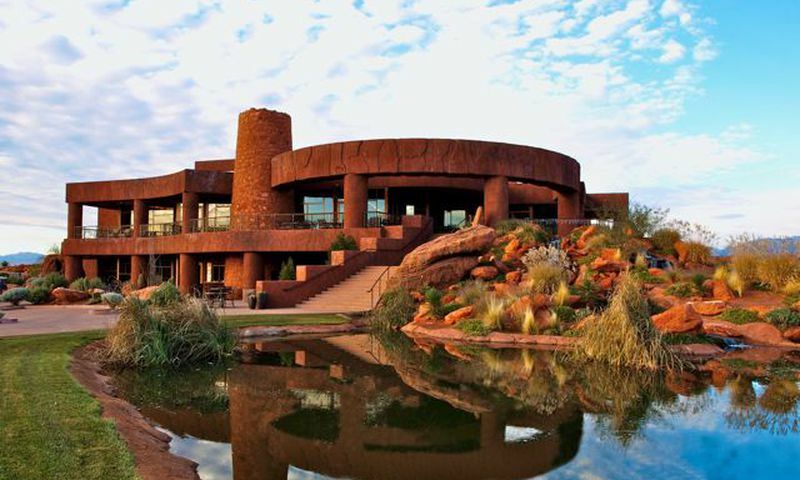 Entrada at Snow Canyon Country Club is renowned for offering a premier golf experience. Situated among the Bryce Canyon National Park and within proximity of Zion National Park, this renowned community offers a nature lover's paradise in addition to its distinguished country club lifestyle. With more than 300 days of sunshine per year, residents are sure to enjoy this community. In addition to world-class golf in Southern Utah's most exclusive private club, residents enjoy social clubs and getting together for pickleball, bridge and tennis. An on-site activity director organizes hikes, themed dinners and dance parties. While maintaining an exclusive status, the community enthusiastically welcomes new members too. Situated ten minutes from downtown St. George and in proximity of Interstate 15, this community is surrounded by some of the most stunning natural attractions of the USA. These include Lake Powell, Zion and Bryce Canyon National Parks, and the Grand Canyon. Even surrounded by natural beauty, residents are within minutes of restaurants, local merchants, grocery stores, the Coyote Gulch Art Village and the Red Cliff's Mall. For large scale entertainment, Las Vegas is only a two-hour drive away from the community. Entrada at Snow Canyon Country Club offers luxurious homes, fabulous amenities, and an ideal location for Baby Boomers in Utah. Clubhouse - 22,000 Sq. Ft. Fitness Center - 13,000 Sq. Ft. There are plenty of activities available in Entrada at Snow Canyon Country Club. Here is a sample of some of the clubs, activities and classes offered here. The Escapes at Entrada Series are Single Family Homes built by Henry Walker Homes. The Toroweap at Entrada Series are Single Family Homes built by Richardson Brothers. These homes can be found on a new construction basis. Entrada has stunning views and is a beautiful community. We would never leave here for anything! We love all the amenities, the golf, pools, gym, tennis ... everything is outstanding and the natural beauty of the area is breathtaking. 55places.com is not affiliated with the developer(s) or homeowners association of Entrada at Snow Canyon Country Club. The information you submit is distributed to a 55places.com Partner Agent, who is a licensed real estate agent. The information regarding Entrada at Snow Canyon Country Club has not been verified or approved by the developer or homeowners association. Please verify all information prior to purchasing. 55places.com is not responsible for any errors regarding the information displayed on this website.